Photo Mystery: Is This Herman? Many times old photos come with mysteries…have I solved this one? I recently acquired a number of photographs from a kind cousin. Many of the photos were either labeled or we knew who the people were from having other photos of them. Most of the photos were of Julius Goetz, my cousin’s grandfather, who was the half-brother of my great-grandfather, Joseph Bergmeister. I still only have one photograph of Joseph, but I have many of Julius who was a very photogenic young man. In one photo, Julius is standing with another man – could this be his brother Herman? I’ve written about Herman before – because he died so young, no one in the family even knew who he was much less had any photographs of him. But, my cousin had two First Communion photographs of boys, and we knew which one was Julius. By assuming the other photo is brother Herman, and by using other available information, I’ve deduced that this is indeed a photograph of the Goetz brothers. 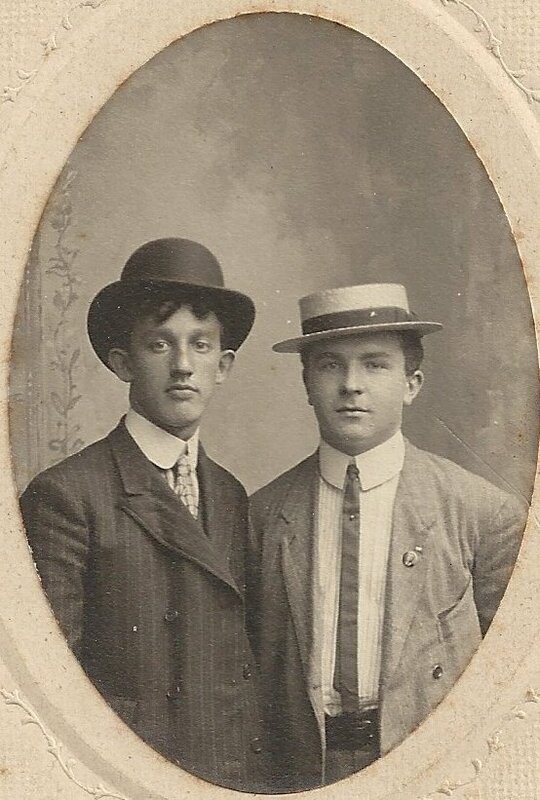 Julius Goetz is on the right – is the man on the left his brother Herman? Herman was born on 14 May 1885 and Julius was born on 09 November 1886. While the two men may not resemble each other very much, I know a lot of siblings that don’t look much like each other because each favors a different parent. From Herman’s passenger arrival record in 1911, we know that Herman was 5’9″. On Herman’s WW1 draft registration card, filled out shortly before his death, he describes himself as tall and stout with grey eyes and red hair. Julius was not as tall as his brother. On both his Declaration of Intent in 1908 and his 1919 U.S. Army discharge papers, he is listed as 5’5″. Also on both his is listed as having blue eyes, brown hair, and a medium build. If the above photo does show the Goetz brothers, it would have been taken between April 1911 (when Herman arrives in the United States) and October 1918 (when Herman dies). The brothers would have been between 25-26 and 32-33 though I’d guess it was taken shortly after Herman’s arrival when they were reunited. Julius had been in the United States since age 16 in 1902, so nine years had gone by since the two had seen each other. One can easily assume they would want to commemorate the reunion with a photograph! 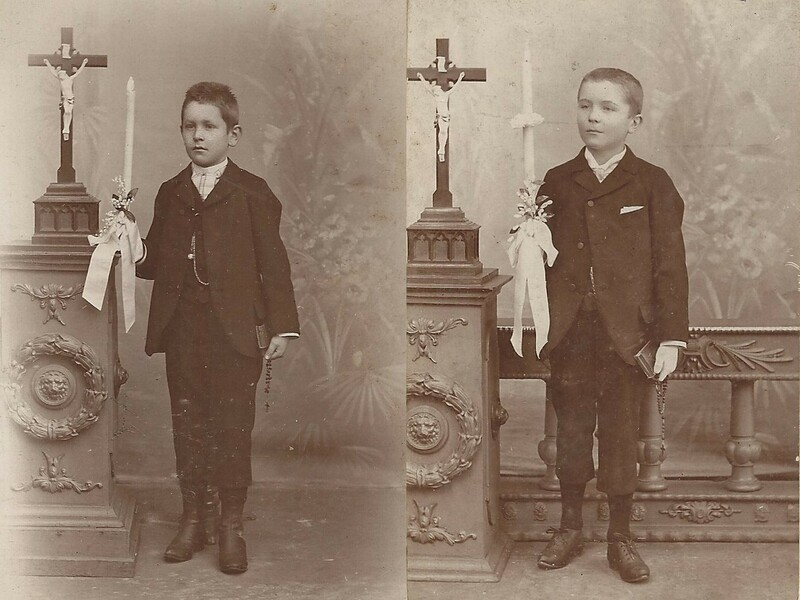 These are the two First Communion photos. Both were taken at the same photographer in Regensburg, Germany: Gustav Wild on weisse Lilienstrasse G. 93. It even looks like the same exact pedestal, crucifix, and background! Herman on the left, Julius on the right. Julius’ photo had the year 1897 on the back, so he’d have been 10 years old. This is consistent with a First Communion certificate for his half-sister who was also 10 when she received hers in 1890. Do you think the man on the left is Herman? In comparing the photos, the shape of the ears, noses, and mouths appear to be the same from the children to the adults. This, as well as the confirmed height difference of the two men as shown above, makes me believe that it is Herman with Julius. What do you think, readers? Proud descendant of the two gentlemen below coming it at nearly 3′ tall! 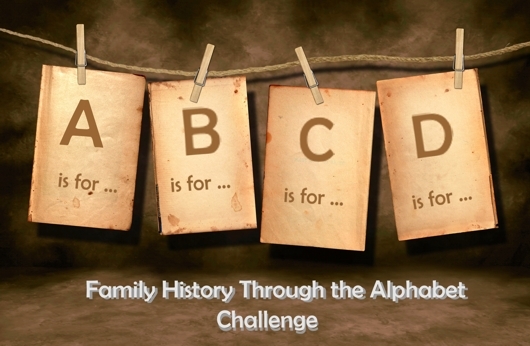 Continuing the Family History Through the Alphabet series… V is for Vital Statistics! Line up your ancestors and check out their vitals! When genealogists speak of “Vitals” we are usually referring to the information obtained from Vital Records: Births, Marriages, and Deaths. The term “Vital Statistics” refers to stats relating to these records. Although the second definition is primarily used for a woman’s physical “stats,” I’m using it in a slightly different non-sexist way. For me, Vital Statistics are the information I’ve obtained from genealogical records about my ancestors’ physical descriptions such as their height, hair color, eye color, and more. This information is especially relevant to me for the ancestors for whom I have no photograph – these “stats” are the only way for me to see what my ancestor looked like. Where does one find such information? If your ancestor immigrated to the United States in 1906 or 1907, the passenger arrival records include the immigrant’s physical description: height, complexion, color of hair and eyes, and identifying marks. Draft registration cards are a great source of physical descriptions for male ancestors. Naturalization records also ask for physical descriptions. Other resources might include military records or employment records. When my great-grandfather Joseph Zawodny filled out his WWI draft registration card in 1918, he was 38 years old. The cards were not very specific, and he listed his height and build as “medium” with brown eyes and dark hair. But what was considered medium height and build back then? The more specific information requested for his Declaration of Intention four years later in 1922 might answer that. He lists his height as 5’7-1/2″ and his weight as 164 pounds. He had a fair complexion, brown hair, and brown eyes – which fits with the black and white photograph I have of him. Then again, the records may not always be correct or consistent. 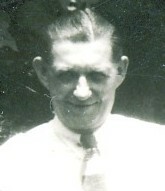 Take, for example, my other great-grandfather, Louis Pater. When he arrived in the U.S. in August, 1907, he was only 14 years old. He was only 5′ tall with blond hair and blue eyes. On his WWI draft card at age 23, he said he was “tall” and “slender” with brown hair and green eyes. Four years later on his Declaration of Intention, he lists his height as 5’10” and weight as 150 pounds. He has a “dark” complexion, “dark brown” hair, and “grey” eyes. Finally, on his WWII draft card at age 48, he seems to have shrunk to 5’9″ and put on a few pounds at 190. He has a “ruddy” complexion, “brown” hair, and “brown” eyes! So, were his eyes blue, green, gray, or brown? Likely gray – that was the color of the eyes for the entire Pater family and he passed them on to his son! I don’t have any photograph of my great-grandmother Rose Piontkowski. But because she arrived here in 1906, I know from the passenger list that at the age of 41 she was 5’3″ with brown hair and blue eyes. It’s not much, but at least it gives me some idea of what she may have looked like. I don’t have a photograph of her husband John either. He was too old for either draft, but he filed his Declaration of Intention in 1920 at the age of 49. He was 5’8″, weighed 150 pounds, had a dark complexion, brown hair, and gray eyes. Sometimes the descriptions on the passenger lists aren’t very flattering! Take my great-great grandmother Antonina Pluta Pater. Thanks to her passenger arrival record, she will forever be known as having a “sallow” complexion and a “wrinkled forehead” in addition to her 5’2-3/8″ frame, brown hair, and blue eyes! Vital stats such as height or eye color are obviously not as useful as actual vital statistics like birth and death dates. But, it does give us a nice “look” at our ancestors. It is also fascinating to create family trees that show things like eye color – biology class in high school suddenly becomes more interesting. So as your family tree grows, take some “measurements” along the way and see which ancestors you most resemble! 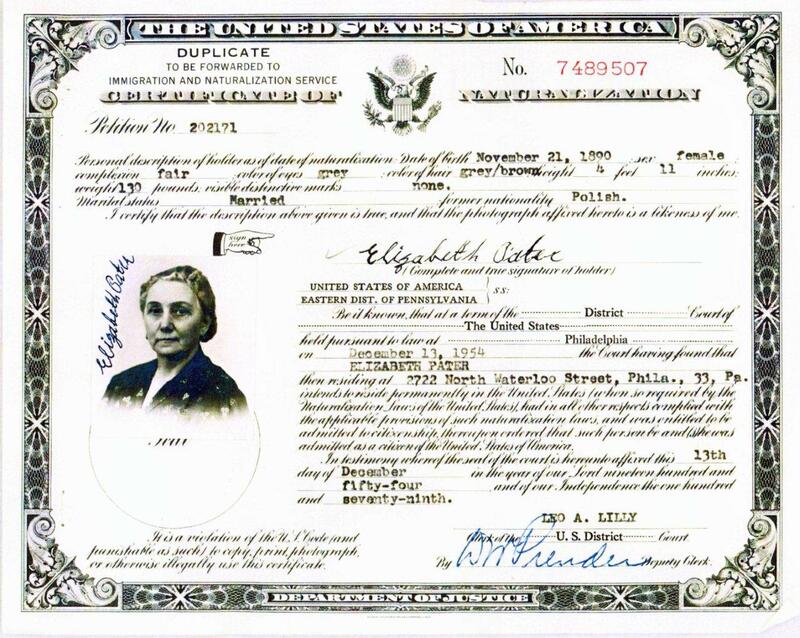 Naturalization Certificate of Elizabeth Miller Pater, who was naturalized on December 13, 1954 at the age of 64. Of all the great discoveries I’ve made in over twenty years of genealogical research, one of the most amazing was made just this last month! It didn’t add a generation to the family tree or uncover new names, but it brought both a smile to my face and a tear to my eye. Several months ago while finding my ancestors on the 1940 Census, I realized something that I should have realized a long time ago: my great-grandmother Elizabeth Miller Pater wasn’t naturalized, at least not in 1940. Even though her husband (Louis Pater) was naturalized in 1925, wives had to file separately. I searched for her papers in the same court that her husband used, but nothing was found. It finally dawned on me that she would have had to file for the Alien Registration Act in 1940. There were two things I desperately wanted to find regarding Elizabeth: her birthplace and a photograph. Would her alien registration papers help me? I have written before about how difficult it was to find Elizabeth on the passenger arrival records. With a surname like Miller (or Müller), there were plenty of candidates. But I did find her eventually (see the link above). According to her passenger arrival record, she came from Żyrardów, Poland, which I assumed to be her birthplace. In the naturalization file, the first smile on my face was at the fact that the U.S. Government couldn’t locate her – at first – on the arrival records either. Referring to your citizenship application in which you allege arrival at Philadelphia, PA on Apr. 16, 1909 via S.S. unknown, you are advised that all records at the port at which you claim entry have been examined and no record referring to you has been found. I laughed….yeah, I couldn’t find her at first either! But eventually, they did, once they searched for the port of New York and looked under her maiden name. She was trying to remember an event that took place 45 years before, so her memory was a bit fuzzy on the details. I also smiled because every paper in the packet identifies her birthplace as Żyrardów, which I assumed, and her birthdate as 21 November 1890, which I knew from other records. This made me smile because more than one researcher has been unable to find evidence of her birth in Żyrardów on that date. I know that should make me sigh, not smile, but my own conclusion based on my extensive research was exactly what she said. A recurring theme on this site is my desire to find photographs of my ancestors because I have so few. I even entitled one post about Elizabeth “Do you have a photo of my great-grandmother?” I did have one, and I didn’t want to be greedy because one is so much better than none at all. So when I saw Elizabeth’s photo included in the naturalization documents, I cried. It was tears of joy, but it was the first time in my life I found a new photo of a great-grandparent – the few photos of six of my greats have been with me since childhood. This one was new. She’s a bit older, and looking not-too-happy, but it brought me great joy to see her. And also to see a resemblance-she immediately reminded me of my Aunt Joan, Elizabeth’s granddaughter. Um, wait… WHAT? SHE HAD A PARENT IN THE UNITED STATES IN 1940? I had a great-great-grandparent here in the United States! That, my friends, was news to me. When she came to the country in 1909, she came alone (at age 18), and there was never any indication that either of her parents came here. I have suspicions it was her mother (yet another future post on why I recently had those suspicions). Either way, again the surname of Miller is a bit problematic. I have found one candidate on the 1940 census for her mother, Elizabeth Smetana Miller, and none for her father, John Miller. Both were born in Poland, likely in the town of Zelów in the Łódź province, and lived in Żyrardów in the Mazovia province since before Elizabeth’s birth in 1890 and at least at the time of her immigration in 1909. Much, much more to come on this new development as I track down which parent was here, when they came, and where they lived. And the obvious…that one parent here in 1940 was also required to register as an alien (assuming they hadn’t been naturalized prior to 1940)! That’s the great thing about genealogy – you’re always discovering and finding something to smile about (or sometimes cry about). And, there’s always the possibility that you’ll be surprised. Here’s to more great discoveries! 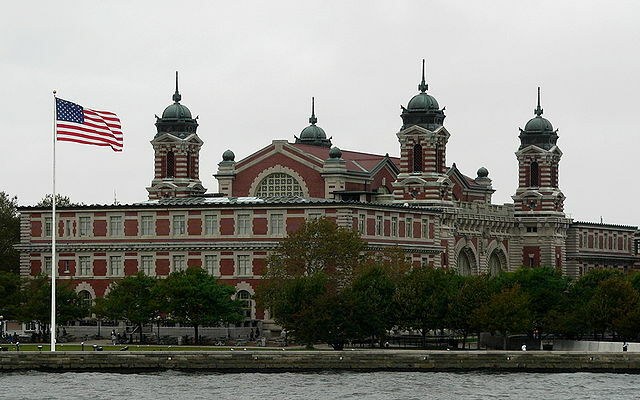 Continuing the Family History Through the Alphabet series…E is for Ellis Island! Few places in America have the legendary status of Ellis Island. Any family history that includes early 20th century immigrants holds Ellis Island in high regard as the entryway to this country. There were other ports in the United States, but Ellis Island brought the largest number of immigrants to the U.S. and is the most well-known and perhaps the most “romanticized” of the ports that drew, in the words of Emma Lazarus inscribed on the Statue of Liberty, “your tired, your poor, your huddled masses yearning to breathe free” to this country. Ellis Island was only one stop on a very long journey, but because it was the entry point to the United States, it seems to summarize the entire immigrant experience. At some point, my ancestors made a decision to leave their homeland. In some cases, they left their parents and siblings behind and never saw them again. Maybe they left because of economic concerns, or maybe they just had adventurous spirits. All of them, I’m sure, hoped for a better life once they arrived here. As a result of that one decision, they traveled long distances from Germany and Poland to ports throughout Europe: Hamburg and Bremen in Germany, Antwerp in Belgium, and even Southampton in Great Britain. Then the transatlantic journey began – approximately two weeks at sea. Third class steerage was no vacation cruise; quarters were cramped and uncomfortable. Some of my ancestors made the journey alone, including some females, and other female ancestors bravely traveled with their young toddlers. And then…America! Their first glimpse of the new country, their hope for a new life, was Ellis Island. I have no idea what they thought at that moment, but I do know that without that decision, without that journey, without that arrival into a melting pot of a new country with a new language and a new way of life, I would not have been born. Or if my ancestors from different countries did happen to meet elsewhere in the same combination, I would not be American. Therefore, I’m very grateful for their decisions and their journey that brought them to Ellis Island. Over 12 million immigrants entered the United States through Ellis Island between 1892 and 1954. Fortunately for their descendants who are interested in genealogy, passenger lists were required for each ship. The lists provide a wealth of information, but some years have much more than others. Besides finding out ages, occupations, and occasionally birthplaces, we also sometimes learn the physical descriptions of our ancestors. Without photographs, learning the person’s height, hair and eye color, and complexion allows us to mentally picture these travelers. The lists make the stories “real” – the first time I found one of my ancestors on a passenger list (on microfilm in pre-digital days), I let out a whoop of joy and did a genealogical happy dance. Those names I learned were really real! That’s how my family research began – finding my family’s American beginnings in Ellis Island’s records. I finally took my own journey to Ellis Island in the summer of 2010 with five genealogist friends. It was a wonderful experience. I was surprised the “Great Hall” was not quite as large as it looks in photographs. What made our trip meaningful was that all of us had ancestors who arrived through that port and the realization that their fateful decision to come here shaped our own lives. 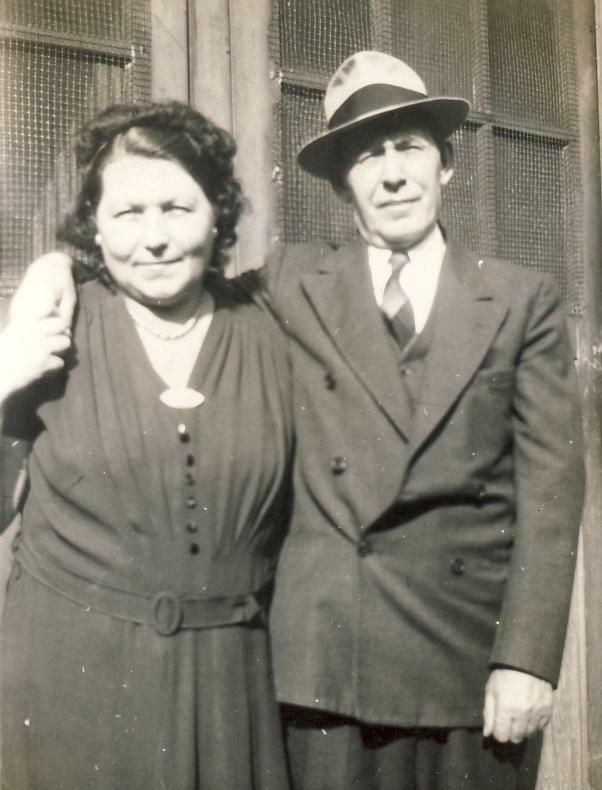 Husband Josef, my first direct ancestor immigrant to the United States, actually arrived via the port of Philadelphia in 1900. 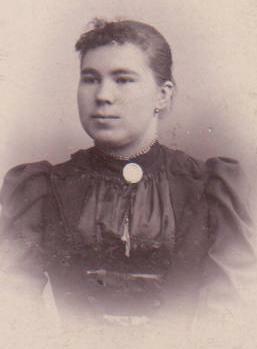 Josef’s sister, Hilaury (23), arrived 25 July 1893 on SS Friesland from Antwerp. Their brother, Ignaz, arrived at the port of Philadelphia in 1904. Half-brother Julius Goetz (16) arrived 22 September 1902 on SS Zeeland from Antwerp. Half-brother Herman Goetz (26) arrived 03 May 1911 on SS Finland from Antwerp. Sons Wacław (17), Ludwik (14), and Stefan (12) and daughter/son-in-law Francziska and Pawel Miedzinski (Nieginski) (20 and 27) on 15 August 1907 on SS Grosser Kurfurst from Bremen. Her brother, sister-in-law (2 arrival records), niece, and nephew (born in U.S., left, returned to U.S. via Ellis Island) and various Miller “cousins” also arrived through Ellis Island. Wife Wacława arrived via the port of Philadelphia later in 1902. I have previously written about several of these immigrants as well as using passenger lists for research. Read the other posts about passenger lists and the immigration experience here. Passenger Lists: The Way It Was! This week I am highlighting some random facts about passenger lists. Today’s post won’t offer any helpful searching hints or useful sites. Instead, let’s journey down memory lane to the good old days before we did our research on the internet. Wait, why exactly do we call them the good old days? 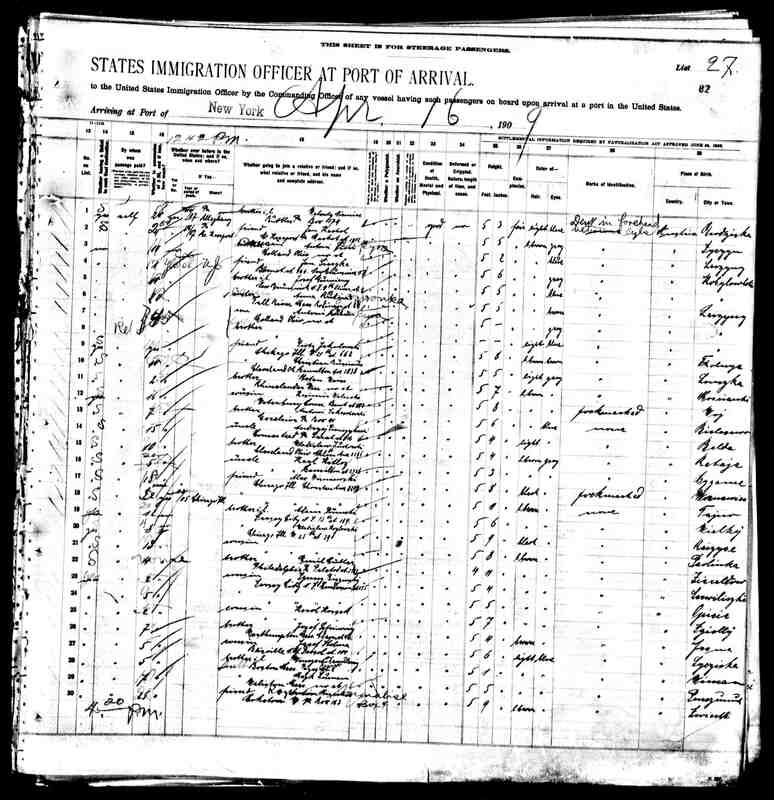 If you are a “new” genealogist, you may be surprised to learn that in those dark old days before passenger arrival records were available online, copies could be obtained from NARA. They still can be ordered from NARA, but most people choose to save a digital copy from the various search sites, or simply print their own copy instead. But back then, getting a copy through NARA was the only way to “own” the image. The best thing about it? The photocopy measured 17” x 22” – big enough to read every detail! I have wondered if this was close to the size of the original documents (I’ve asked NARA but did not receive an answer). Being able to print a manifest sheet on your own computer is wonderful, but shrinking it to 8 ½ x 11” just isn’t the same. Also back before the lists were available online, the index/soundex to the lists consisted of microfilmed index cards that would reference a group and a line number. The group number was the page, and the line was the line on that page. That does not sound very difficult, but the problem was that the pages were not clearly numbered. In fact, there were usually multiple numbers, either handwritten or stamped, at the top of every page. Case in point – here are two images…one is the left-hand side of the top of the page, the other is the right-hand side. Note the multiple numbers! Will the real page number please reveal yourself? Once you figured out which one of these was the actual group number, then it was easy. But, jumping directly to the page in question is a big time saver in research! I consider this one to be like the difference between using a tv remote and getting up to change the channel on the television (if you’re old enough to remember what that was like). Sure, you can change it by hand, but it’s so much easier to change it from the couch! This week I am highlighting some random facts about passenger lists. 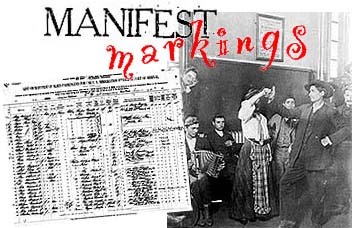 Today’s random question: did you ever wonder what all those scribbles are on the manifest? The best information I have ever found on the various markings is at Manifest Markings hosted on Jewish Gen. If you have immigrant ancestors and have not seen this site, you are in for a delightful learning experience. You’ll learn all about the miscellaneous letters, numbers, and checkmarks that fill up every square inch of the arrival record. 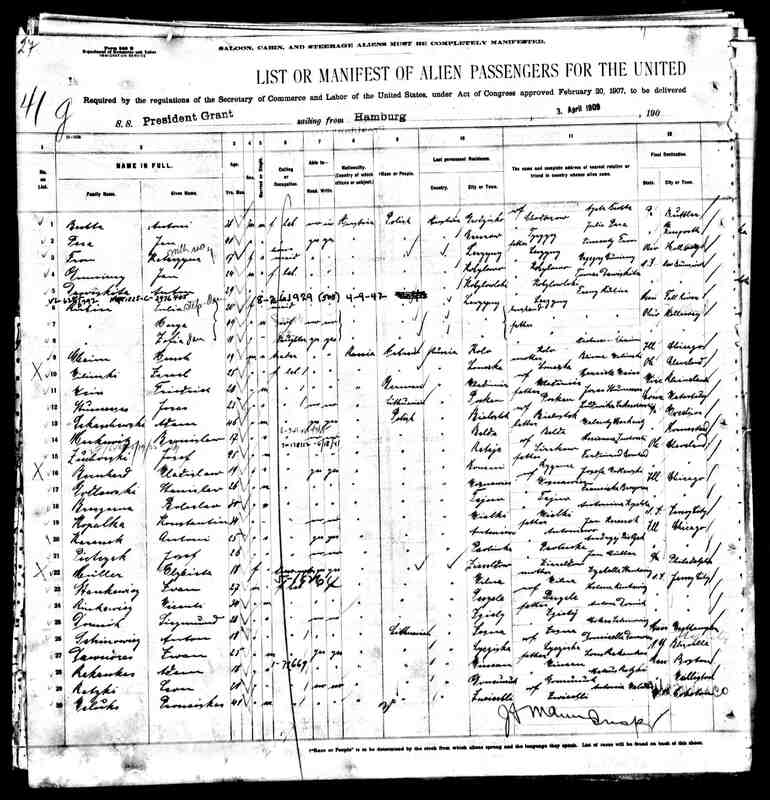 If you’ve been searching for immigrant ancestors in the passenger lists, you may have noticed that some names have dates and numbers that appear to be added around the name in a different handwriting. Often these are records of naturalization proceedings for the immigrant. A passenger's record of nauralization years after his arrival in the U.S.
Another useful bit of information is the casual X that marks the spot next to some passengers names, but not all. If you see an X next to your immigrant’s name, that is a sign that they were detained at the port for some reason. Often, if you scroll to the very end of the ship’s lists, you may find more info on why they were detained or for how long. 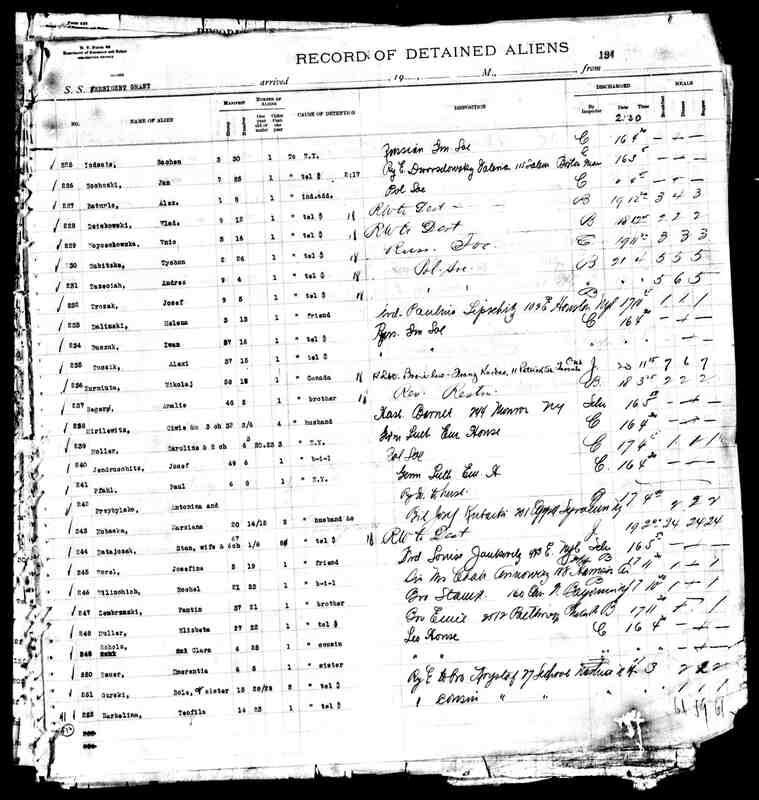 This is a detainee list at the end of a ship's arrival records. The last entry shows my great-grandfather with his brothers, sister, and brother-in-law. In the above instance, my great-granfather and his family were detained because his older brother had a physical deformity. Fearing he would be a “LPC” or Likely Public Charge (unable to work and required to live off of government assistance), he needed to be examined by a doctor. Also, two of the boys were under 16 years old and traveling with their older sister and her husband. This case was a “special inquiry” and they were detained for several days. But most of the detainees were simply held to telegraph for money so that they could travel to their final destination. Overall, this is a very useful site to help you get a better understanding of the passenger arrival records as well as the process that the immigrant had to go through in order to enter the country. This week I am highlighting some random things about passenger arrival records. Today’s focus: accidental discoveries in Ancestry.com records! For some ports, Ancestry.com indexes don’t just have the names of the passengers, but also the names of their friends that were already in the U.S. waiting for them. For Philadelphia passenger lists, I found this out quite by accident. What this means is that if you enter a name into the search field, you’ll get hits not only for manifests with immigrants of that name, but also if that person was listed as the point-of-contact for an immigrant. This is an excellent way to find possible relatives! 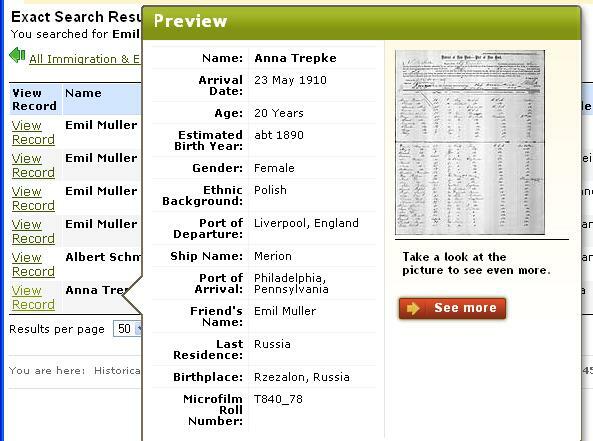 In this particular instance, Anna wound up being a sister-in-law of the Emil Muller that I was researching (based on his home address and relationship on the record). The name was previously unknown to me before beginning the search. I have only found this for Philadelphia passenger arrival records so far.The results were the same when I used Steve Morse’s One-Step Search for the Philadelphia arrivals. The major difference is that Ancestry brought up the “friend” records in addition to the records for passengers with that name. For Steve’s site, you have to enter the name as either the passenger or the friend. Steve’s search also has the “friend” field listed for New York arrival records, but I tried various names that I know were listed as the friend on arrivals and the search (forwarded to Ancestry) did not find any of them. I don’t believe this field is indexed as it is for Philadelphia passenger arrival records. I have not tried any other ports, but if you find “friends” indexed in other records, please leave a comment! Immigrants who sailed from English ports like Liverpool and Southampton may still be found in the Hamburg, Germany passenger list indexes! Why? Because many European immigrants first sailed from Hamburg to Great Britain to get to their ship that would take them to America. This was another accidental find while searching for one of my surnames. I knew my great-grandfather’s brother, Stefan Zawodny, sailed from Liverpool on 16 May 1903 and arrived in Philadelphia on 30 May. 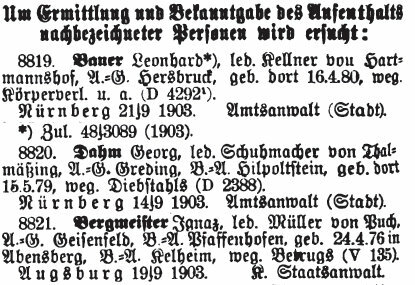 So I was surprised to find a record in the Hamburg indexes, because I assumed they were passengers sailing from Hamburg to various ports. I had forgotten about the indirect sailings from Hamburg to Great Britain. In the Hamburg passenger lists I found him departing for Liverpool on 08 May! Find more information about the Hamburg passenger lists here. This highlights the fact that our ancestors had a very long journey to get to the United States. April 16, 1909 – Welcome to America! 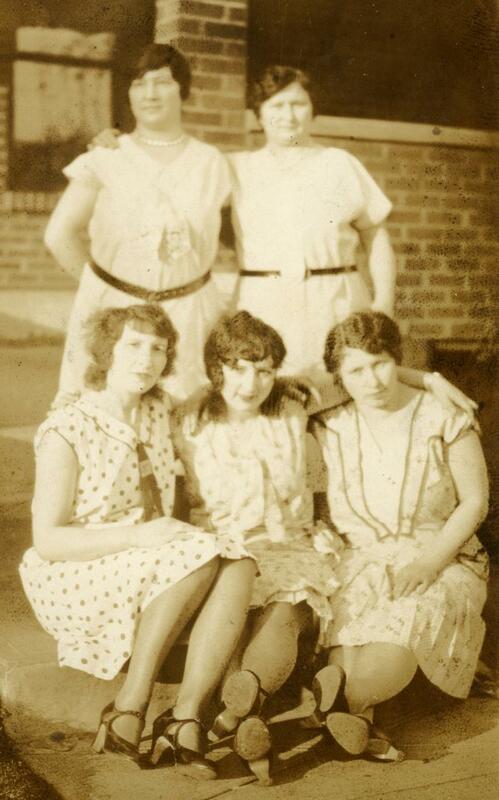 Today marks the 100th anniversary of the arrival of my great-grandmother, Elżbieta Müller, to the United States. She soon Americanized her name to Elizabeth Miller, and the following year became Elizabeth Pater after marriage. 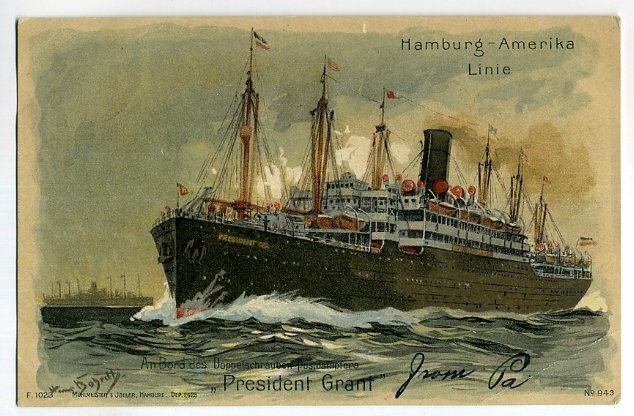 Elizabeth sailed on the SS President Grant, a ship of the Hamburg-American line. The ship left Hamburg, Germany, on April 3, 1909, and arrived at Ellis Island in New York City on April 16th. The passenger arrival records for 1909 include a number of details that are not found on earlier records. From Elizabeth’s arrival record, I learned the following information: She was an 18-year-old Polish dressmaker from “Zieraldow, Russia” who was able to read and write. Her nearest relative in Poland was her father, Jan Müller, in Zieraldow. 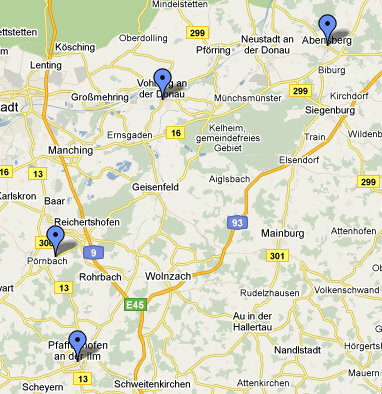 Her destination was Philadelphia, PA to go to her brother, Emil Müller, at 2512 Palethorp Street. The manifest indicates she was in posession of $4, but then “None” was written over it. The record provides a physical description of her having light brown hair, gray eyes, and a height of 4’11”. Her place of birth is indicated as Zieraldow, Russia. I take a special delight in her arrival above all other immigrant ancestors, because it is an example of one of my biggest mistakes in my genealogical research. A name like “Elizabeth Miller” is very common, so her record was rather difficult to find. There were immigrants that bore that name from Ireland, England, Russia, Poland, Germany, and Hungary. Many years ago, very early in my genealogical quest, I thought I found her record. Only to find out years later that I was wrong – and in fact, I had been tracing the incorrect family and birthplace all the while. I forget exactly what prompted me to take a second look, but I’ll never forget my reaction to finding her actual record that I discuss above…”She’s from Żyrardów? !” I knew that the “Zieraldow” on the record was merely Żyrardów misspelled. I kept repeating it to myself, smiling at my error. You see, my first surprise was that my great-grandparents were not a married couple when they “came over”. I wondered how they managed to marry the year after her arrival when my great-grandfather had been here for a few years as a young teenager. The answer? They were from the SAME TOWN – which is how I knew that “Zieraldow” was a misspelling (which I naturally proved through research as any genealogist would). When I found this record, her real arrival record, there were several facts that confirmed or provided adequate proof that it was the correct person, including her age, father’s name, and brother’s name and address. I noticed that the manifest had a big “X” next to her line number. That is a signal that the passenger was detained for some reason, and there may be more information available. For more information, see A Guide to Interpreting Passenger List Annotations. The key to finding the additional information is to find the manifest (on either microfilm on online records), then scroll to the very end of the records for that ship and date of arrival. At the end of the “normal” manifest listings, there is a record of detained passengers. It appears that they detained Elizabeth because she had no money to get to Philadelphia, so she had to telephone her brother for money. They discharged her from Ellis Island the following day, April 17th. I wonder what was more stressful – traveling alone to a new country, or being held overnight once she got there? Besides my delight with this find after such a long search for the correct record, finding Elizabeth’s arrival was fun for me because she has the distinction among all of my great-grandparents and immigrant ancestors of being the only one that I met. I don’t remember the event or how many times I actually met her, but my mother tells me that Elizabeth held me on her lap on at least one occasion. To me, this knowledge gave me a more tangible “link” or connection to my immigrant ancestors. She became more than a name or a face in a fuzzy photograph – I met her, even if I was too young to remember it. My great-grandmother died in 1972 when I was five years old. Today I commemorate her arrival to the U.S. and honor her for making that long journey alone to begin a new life in a new country. Welcome to America, Elizabeth! I am certainly glad you came. One of my goals this year is to get organized, which includes all of my genealogical files as well as the rest of my house and my life in general. As any genealogist can tell you, especially one who hasn’t filed their “finds” in a while, this can be quite a time-consuming undertaking. Anything researchers find that can make your life easier later is worthy of sharing with others. So, Donna’s Organizational Tip of the Day — use extract forms to record information! Most of us have seen various free extract forms for census records, but what about ship’s passenger lists? You could create your own, but someone named Lisa Perkins has already done the work. An Italian genealogy site has a wonderful collection of Manifest Extract Forms that are freely available in both PDF or html format. What are they? Extract forms are used to record information “extracted” from record sources. Because the information recorded on passenger lists varied over time, four different forms are listed for four time periods: 1893-1906, 1907-1918, 1919-1925, and post-1925. While there are no forms for lists prior to 1893, you can easily create your own. Before 1893, however, there is far less “personal” information included on each passenger. Depending on the year of arrival, you can gain a wealth of information about your ancestor, including their place of birth. Also interesting are the questions about their appearance such as height, hair color, and eye color. If you don’t have a photograph of an ancestor, at least this can help you imagine their basic appearance. Why are they useful? Forms such as these are useful for several reasons. First, they can help you get your information organized so you don’t have to search through various papers or images to find what you are looking for. In fact, you don’t even have to print out a copy of the actual list unless you need it for another reason, such as illustrating your family history book. Using the extract forms instead of saving the actual files can save you “filing cabinet” space, whether you file papers or file images on your hard drive. The forms are also useful in noticing facts that may have been overlooked in your initial “find” such as that interesting column entitled: Ever been in the US before? When and where? Because of the hard-to-decipher handwriting on some lists, and the jumble of names thrown together, this can easily be overlooked. Check out the Manifest Extract Forms site, download the forms, and get your information organized! If At First You Don’t Succeed…Keep Searching! Back in the “pre-online” days of genealogy, one of my earliest finds was the passenger arrival record for John’s wife, Rose. She arrived in New York on the S.S. Armenia in November 1906 and was accompanied by her son Józef, age 3, and daughter Janina, age 10 months. 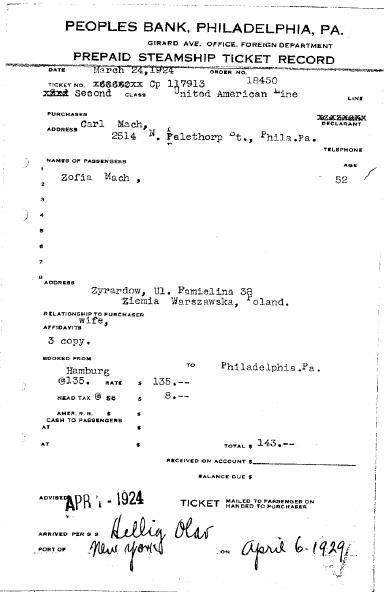 The record indicates that they are going to their husband and father John (Jan in Polish) in Philadelphia. Because the age of Janina is so specific, I concluded that John had to arrive in the US post-conception, or approximately between May 1905 and November 1906. Of course, this assumes he is her father, but I felt that this was a reasonable assumption! Although several men named Jan Piontkowski (and its variations) fit this timeframe, I could never prove that any were him. I was not aware of any other family members, or any other possible destinations in the US, so it was impossible to verify. Over the years I searched on many name variations as well as other ports. Even Steve Morse’s site couldn’t help me (though it did help on many other occasions)! I could have saved myself some aggravation if I knew that he was naturalized. I’m sure I checked the indices at some point (note to beginners: keep a record of both successful searches as well as failures) because I always run through multiple family names. But somehow I missed it. Was it indexed incorrectly? The most embarrassing fact is that on the 1930 Census, it clearly says that John is naturalized. But even the census can be wrong, right? Then I wiled away some internet time searching on Footnote.com. On such sites, I usually find nothing, no evidence of my family’s existence. So imagine my surprise when I see a Declaration of Intention for John Piontkowski in Philadelphia! Doubtful, yet excited, I ordered it, and sure enough it appeared to be my great-grandfather. Clues in his favor were the right occupation (leather worker), birthplace (Warsaw), age (born 1871), and wife’s name (“Rosie”). I remained slightly skeptical until I saw the Petition for Naturalization, which confirmed his identity because it includes the children’s names and birthdates. I had trouble finding the petition itself because John decided to suddenly include his middle name, Bolesław, which I never knew he had. I also got a full birth date for his wife, who was five years older than her husband – a fact which gets “covered up” on various censuses. Naturally (no pun intended), I also got John’s arrival information – the S.S. Pennsylvania, arriving in NY on 04 March 1906. I had to see the record for myself…what did I find? A non-descript entry for Johann Piatkowsky, going with a friend to “Port Chester, NY” to another friend. Basically, someone I would have assumed to be him. I may have found the name, but without some designation – even just Philadelphia as a destination – I probably would have passed this by. One important note: When dealing with Polish names, “normal” indexing can be flawed. Anyone knowledgeable about Polish surnames knows that a variation of Piontkowski is Piątkowski, with the “ą” character sounding similar to the “on” sound. While soundexing would take several variations into account, a Piatkowski simply will not show up when searching for Piontkowski because of the missing consonant. Be vigilant! The moral to the story is to search, research, and search again. While I’ll usually post about how to accurately perform research, in this case please don’t do what I did – if the census says someone is naturalized, it’s worth a look!